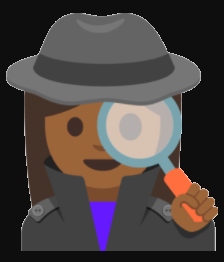 Several months ago I encountered the emoji that is known as the female sleuth or detective at emojipedia.org. She comes in a lot of different looks and many of the emoji sets have her in several different skin colors. 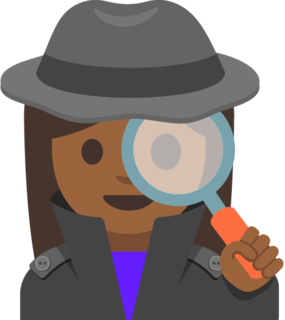 I’m a real Luddite when it comes to emojis in my personal communications, but I liked the idea of using the Android 7.1 female sleuth as the Open-Meta.org icon. As a clear sign of approaching dementia, I even spent yesterday afternoon in the college’s computer lab trying to get Photoshop to produce an image with a transparent background but without the halo. After lots of fumbling and Google searching I stumbled over the blur tool, sharpened it down to 3 pixels, and, with a lot of rubbing, managed to soften the edge. On the page that shows all the Android 7.1 icons the images are 144 x 144. But if you click on one of those images you’ll go a new page for just that image, where it’s available in a 320 x 320 size. Note that these are square, but this emoji is taller than it is wide. On emojipedia.org, these emojis are pushed to the left side, so all that’s necessary is to crop off some of the transparent background on the right side to get a highly usable graphic. Any image editor can crop – even the one available here in WordPress. It was a long and difficult labor, but welcome to the team, iconic female sleuth.